Palm Tree Removal & Trimming / How Much Does it Cost? As with any other kind of tree, the total cost to remove or prune a palm tree depends on several different factors. Before doing any additional research, remember that the utility company should be contacted if the tree is dangerously close to power lines. Although not ideal, this could potentially save you a lot of money if you don’t have to pay for it and the utility company will remove the palm tree for you. 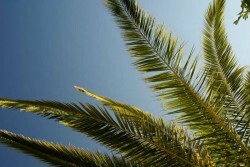 Learn the important considerations regarding palm tree removal and trimming costs below. I have a 16 foot 8yr old palm tree which I hate to Kill by cutting it down . It is a beautiful tree but do to a recently installed service it needs to be removed. I don’t want to pay a lot and the tree is healthy and could be sold if removed properly. Would like a quote on the price or would you be willing to remove the tree and resell it as part or all of the cost of removel??? ?